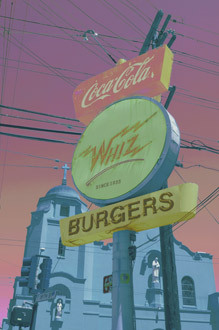 Whiz Burgers, San Francisco, California, Custom, copyright 2010 David Leland Hyde. Many people today would rather not discuss environmental issues. The environment is a subject that reminds people of thoughts and emotions they are often trying to forget. Bringing up such topics, some consider as taboo and as deadly to conversation as discussing politics or religion. Along the same lines, when people are faced with, and allow to sink in a bit, some of the scientifically established facts of climate change, they respond with a wide range emotions: denial, rage, fear, grieving, indifference, resignation and others. If we do discuss climate change, it is with a dispassionate distance, as though it is not a matter of survival, of the life and death of our species, but something mildly in need of our intellectual attention and problem solving abilities, like an algebra equation. Some believe that an excessively hot planet with temperatures continuing to rise is something we can learn to live with. Meanwhile, many of the most credible sources say that just slight changes will bring about ongoing natural catastrophe, which in turn will readily destroy our economic system and our way of life. Much of this can be debated indefinitely and is, but my intent in mentioning it here to begin with is to emphasize that these are serious, grown up problems that must be reckoned with, not forgotten about or avoided indefinitely. Each of us must start now to act in ways that have less environmental impact. We have to take responsibility and make changes ourselves, individually, regardless of what the US Congress, our president, or other world governments and corporations do. Regularly I see political slogans that say we need to keep Big Oil from causing climate change. True, we do need to stop subsidizing Big Oil, but we also need to remember they are in the business and we are all their customers. If we do not believe in their product, we need to gradually decrease our use of it, in all of its forms. Climate Change through the refinement and distribution of fossil fuels is what Big Oil does for a living. It is what they have done for a living for a long time. Yet we must remember that it is the actual burning of the fossil fuels that is changing the climate. We are doing the burning. Meanwhile, we are asking them to change businesses, when we ourselves will not even change jobs to use less gasoline, or to do work that itself is more earth friendly. We will not change homes, change cars, or change other products we buy and use, yet we ask Big Oil to change the core of its livelihood. The picture will not change until we change. Major seed changes have almost always come from the people, from the bottom up, not from the top down. Top down management has brought us the world we have now, which is a calamitous train wreck about to happen. It would be easier to get off the train if it were moving more slowly, but as the train continues to gain momentum, we will begin to realize that jumping from the train is a better option than staying aboard. As a whole, the civilized world has doubled its energy use since 1980. This is a monumental trend in the wrong direction. Examples of short-term thinking are abundant. When it comes to art, people would rather fill their homes with lots of cheap junk that will wind up in a landfill, than save and gather their resources to acquire a few quality pieces of artwork with provenance that will last and go up in value as a real asset to be sold at a profit or passed on to heirs. We have this same Walmart mentality about many items. We would rather buy a cheaper bike for $250 and have to buy a whole new one every four or five years, than save up and spend $800-$1000 on a bike that will last the rest of our lives. Even the $800 bike will no longer last a lifetime because planned obsolescence and lack of durability are built into the manufacturing system. Cheap is what people want, or is it? Much of this comes down to education and how people are raised. Some parents teach their children to be racists, to hate people of other religions, or conversely, to be tolerant of all religions, to have empathy and appreciation for the diversity of cultures and myriad ways of living and worshipping on this planet. Some children rebel against whatever they are taught anyway, but Culture, environmental awareness, tolerance, open-mindedness or lack thereof are all teachings or programming, as are values, art, ethics and religion, which is man made. It’s all the same God, but some people try to claim that they have a different God, or that if you approach God any other way than by their approach, you are doomed and damned. I can see why some people don’t believe in God at all. Many others object to using the term, “God.” I certainly don’t believe in an angry, vengeful, insecure, spiteful God, the God forced down throats by Puritans and other fundamentalist extremists. The early environmentalists and naturalists, sometimes called transcendentalists, such as Henry David Thoreau, Walt Whitman, Ralph Waldo Emerson and others from the 1800s, believed God was in nature. This is also what Saint Francis of Assisi taught much earlier in the 13th Century. There is much debate as to when environmentalism started, though it could be argued that St. Francis was the first environmentalist. Moving forward into the 19th and 20th Century, one of John Muir’s main purposes for getting out into nature as often as possible, much like St. Francis, was to get closer to God and through immersion in the “works” of God, to have a spiritual, transcendent experience. A belief in God is not required to live a good life, but we must be careful of Godlessness and a lack of responsibility based on lack of faith in anything. Lack of faith in anything often blocks transcendent experience, which is part of what maintains our belief in existence and meaning in it. A belief in karma, what comes around goes around, or religious morality, even the threat of punishment has helped guide people toward fulfilling, thoughtful, sensitive and generous lives. It has kept people from living without regard for fellows or surroundings. When Friedrich Nietzsche said God is dead in the 1800s and people began to give up religion en masse, they no longer had an ethical basis for decisions or actions. People did not espouse any concept of consequences like the karmic law of cause and effect, which western civilization found in the East during that same time, but did not widely accept until much later. With religions often operating at the extremes and religious leaders acting in materialistic or perverted hypocritical ways, outdoor organizations, in many cases, actually now serve the purpose of educating people about God, Goddess, Great Spirit, Allah, Yahweh, All That Is, whatever you want to call It. John Muir founded the Sierra Club in 1892. The Sierra Club’s primary purpose was to educate people about how to live and take recreation in harmony with nature. The Sierra Club initiated the idea of national forest preserves that became our national forests. The early Sierra Club defended and helped maintain the sanctity of our national parks. In the 1960s and 1970s, the Sierra Club, Wilderness Society, Boy Scouts of America and other groups began to talk about the concept of minimal impact that later became Leave No Trace, which is a sort of environmental Golden Rule, or outdoor law of karma. The US Forest Service, Bureau of Land Management and National Park Service cooperatively produced a pamphlet in 1987 titled, “Leave No Trace Land Ethics.” In 1990, the Forest Service in conjunction with the National Outdoor Leadership School established a national education program of Leave No Trace, to work with the Forest Service instructions for motorized recreation called Tread Lightly. Low impact education is now offered through the Leave No Trace non-profit group and many other organizations all over the world. Visit LNT.org for an expanded explanation of each principle. The Leave No Trace principles could even be extrapolated into a business philosophy, a way to create true sustainability on earth. If we could operate industries such as mining and logging using long-term Leave No Trace principles, this would accomplish sustainability, in fact, not just in name. Most sustainability advocates are working too gradually, offering proposals that make industry just slightly greener in baby steps, rather than rethinking from the ground up. Again, just like the issues with Big Oil, and in our own private lives, these changes are often easier said than made, but we need to step up the pace, if the changes are to do any good, or stave off the destruction that is already under way.